Written by Roger B. Rowland for "Sheridan Celebrates" in September, 2003. No one knows for sure when the Sheridan Fire Department was created. With out a doubt it was created by volunteers in the early nineteen hundreds. The concept of a paid department did not come about until the 1970's. One thing we do know is the first fire in Sheridan occurred before the town was created in 1890. "In 1870 John McBroom built his third home, a frame house north of the cabin on a hill. It burned to the ground and the McBrooms and their only child at the time, J.W., escaped along with one china plate." With the formation of the town in 1890 the Town Marshal had the responsibility to coordinate fire fighting. The town acquired two single 40 gallon hand pulled chemical carts. The Sheridan Volunteer Fire Department became a member of the Colorado State Firemen's Association on February, 3, 1925. "A brick schoolhouse was built in 1892 on the land donated by Peter Magnes at the site of the present day Petersburg school building. It caught fire on March 10, 1927 and burned to the ground." "Soon after the need for an established firehouse was recognized, a firehouse was built in 1936 and added onto in 1949." Beginning in August, 1941 a journal was kept by the department. The journal contained financial records of the department, meeting attendance and minutes. The journal was maintained through April, 1975. The journal for the most part was written by department Secretary and Treasurer Maurice Nesbitt. It was a position that Maurice held for about 35 years. No other person has given more years of service to the department than Mr. Nesbitt. The park at Mansfield Avenue and Federal Boulevard is named after Mr. Nesbitt to honor that service. Monthly meetings were held by the volunteers. There was a ladies auxiliary. Meeting agendas included voting on new members, paying of bills, department activities, training, and other items. A volunteer had to pay twenty-five cents ($0.25) per month as dues in order to belong to the department in 1942. No one knows when the first fire truck was acquired by the department. There was discussion in August, 1941 about a new fire truck. The department was very much a social organization when it was started. It was normal to play bingo and card games after the meetings. Refreshments were served at each meeting. That was a practice that would continue into the seventies. It was common for the department to send out get well cards, flowers, and other gifts including cash to ailing members and their families. Another event noted in 1941 was the annual oyster and chili supper. The department also held dances as fund raising for the department. The volunteers held a picnic each year. Volunteer firemen were summoned to calls with a siren located at the fire house. When the siren sounded the volunteers would respond to the fire house. The first one to arrive would write down the location on the chalk board and take the fire truck to the location of the fire. The other volunteers would check the address and go to the fire. Later on during the week days the call would be answered by employees in the town hall next to the fire house. They would go over to the fire house and write the address on the chalk board. In the sixties another siren was added on the south side of town at what is now the Sheridan Middle School. The use of these sirens would continue into the early seventies before they would be discontinued. In September, 1944 Chief Krutsch of the College View Fire Department met with the Sheridan Fire Department to make arrangements for calling each other in case they needed help. This is the first instance of mutual aid for the Sheridan Fire Department. The department was provided a budget by the Sheridan Town Board. In 1946 the volunteers decided to join the new firemen's association. In February, 1947 it was decided to get a lock and keys for the fire house. The following month there was discussion about a new town hall and fire truck. The Fire Department budget for 1948 was discussed and it was decided to ask the Town Board for $500.00. On November 19, 1948 a letter from College View was read stating that they would not answer calls outside their district. The Sheridan volunteers struggled with their own issue of taking the truck out of town. The issue of liability insurance and taking the fire truck to fires out of town was discussed. The Town Board resolved the issue stating the truck goes out of town only to help another fire department already at the scene and when requested by the other department. On June 20, 1949 John Stanfield was elected as the Chief of the Department. In the past there was a new Chief elected every two years. John broke that trend and would hold the position for the next twenty-two years. During his tenure the volunteers would change from a social organization to a department with a strong community service orientation. During his tenure the training of the volunteers would increase dramatically. On March 24, 1950 the volunteers held their first Bingo Party. This was a new kind of fund raiser for the department and would be a primary source of revenue for the next two and a half decades. The Bingo was held at the Petersburg School with about 125 attending. On March 1, 1952 there was significant fire in the Denver Cottage and Trailer Court at 2973 South Santa Fe Drive. Four buildings were damaged by the fire. Volunteer fire departments from Sheridan and Cherry Hills battled two hours to bring the fire under control. In July of 1952 the department hosted for the first time the Tri-County Volunteer Firemen's Association meeting. The department decided to enter their first Tri-County field day competition in September. In August the driving of fire trucks to and from fires was discussed. On the return it was decided not to go over the speed limit and not to use the siren. The oyster and chili supper, spring bingo, fall picnic, turkey bingo, and Christmas dinner were all part of the traditions of the department in 1954. In May the department created a new tradition. On May 13, 1954 "The College View and Sheridan Fire Departments gave a supper for the athletes of the Sheridan Union High School. The main speaker of the evening was the coach from Mines. Sixty nine athletes and about twenty firemen from each department attended." This tradition would continue into the seventies. On September 19, 1954 members of the department attended the Tri-County field day event in Golden taking first prize in the high pressure event. In November nearly 500 attended the annual turkey bingo. The 1955 fire report disclosed the department had responded to a total of 39 calls with 24 in town and 15 out of town. Left to right: Loren Moats, James Proctor, Glen Schat, John Klipke, Benny Ellis, Lee Palmer, Lee Modrell, John Stanfield, and Jack (Bill) Banks. This photograph was taken in 1955. For years applications for membership within the department were decided by a simple show of hands. In January, 1956 the department adopted the use of black and white balls for voting on new members. At this time it only took one black ball to be rejected. That requirement was later relaxed and eventually eliminated in the seventies. A year later the department started to investigate applicants for membership. When ever a person applied to be a member of the department a two man committee was appointed to investigate the applicant. In 1957 the fire department began the first of many inspections of schools within the town. Bingo was banned by the state in 1957. It would be two years before bingo would return. The department held a dance in place of bingo and raised $254.75. The big event of 1960 was the acquisition of the fire department's first rescue truck. Cliff Kealiher of Cliff's Towing and a volunteer in the fire department bought a 55 Ford panel station wagon that had been converted to a rescue unit. It was obtained by the fire department but it is not known if the city bought the vehicle or if it was donated by Kealiher. The issue of radio communication was first mentioned in 1961. The department was told they could have an old police radio. It was decided to investigate having it installed in one of the trucks. After the radio was installed it was reported that it did not operate "too good." On March 19, 1962 "A mutual aid agreement between the City of Englewood and the City of Sheridan for aid at fires was read and it was moved by Yarbrough and seconded by Armstrong to sign. Motion carried." A month later "It was announced that safety belts were installed in all fire equipment and it was moved by Armstrong and seconded by Yarbrough that they must be used." On February 18, 1963, a mutual aid agreement with College View Fire Department was accepted. Everything was interrupted in November when President Kennedy was shot. That event was noted in the journal with the following entry. "November 23, 1963 - Our annual turkey bingo held at the Petersburg School. As this was the day after President Kennedy was shot and most social events canceled it seemed that everybody came to our party. It was that crowded that it was hard to get through to punch tickets and we could not play as many games as usual. We did clear $863.88." With the success of the turkey bingo the finances of the volunteers was improving. In January, 1964 it was reported there was $1,058.30 in the treasury. In March, 1964 "New fire house plans were discussed and it was moved by Armstrong and seconded by Carter that we pay for the preliminary plans to be about $65.00. Motion carried." In April the firemen met at the fire house and worked on the plans for the new fire house. The planning continued through June. In July there was a discussion on tearing down the old fire house building. On August 8 and 9 the firemen tore down the old fire house and cleaned up to start the new one. The new two story fire house was built with the labor of the volunteer firemen. The structure located at 1995 W. Hamilton Place went up in about three months. The firemen held their annual Christmas party in the new fire house on December 20, 1964. The work on the finish and touch ups in the new fire house would continue for months. The sturdiness of the work would be tested in the summer of 1965. On June 12, 1965 the following entry was recorded in the journal. "At night the worst flood ever on the Platte River. About 3 feet of mud and water in the fire house. About half the firemen suffered from minor damage to losing everything they had but their car." The rescue truck stayed in continuous operation for several days. The radio in the rescue truck was the only communication with the Englewood emergency dispatcher as the telephone lines were out at the fire station and city hall. All of the bridges over the Platte River in Sheridan were destroyed. The Hamilton Avenue bridge was on the south side of the US 285 bridge and acted as a dam until it split apart and the debris took out the US 285 bridges. The annual election of officers was put off because of the flood. On July 6 nine firemen met at the firehouse and spent the evening scrubbing it out. In August the department received a plaque from Sertoma for their work during the flood. Also during July the motor on the rescue truck needed to be replaced. In November the department arranged for a phone in the fire house separate from the city phone in the town hall next door. The town hall building was torn down after the flood and the city offices were moved to a building at 4021 S. Federal. The department ordered radios for the trucks. With the attendance so high in the prior year the firemen for the first time held their turkey bingo at the Sheridan High School gym. It was a very good turnout and the volunteers cleared over $1,000. 1966 proved to be a better year as the department recovered from the Platte River flood. A new hose drier was obtained. The firemen were able to do their training in the new fire house. Check sheets were developed for monitoring the maintenance of the trucks. There was a new setup arranged for gasoline. A pool table was purchased. The doors of the fire house were cleaned and painted. An open house was held on June 19, 1966. One hundred thirty-seven people signed the register and light refreshments were served. At the Tri-County field day it was reported that "Our team won first place three man event and the women won second in the donut event." "It was reported that our new truck is ready and that one of our men would go after it." It was the first time the city ever had a brand new fire truck. The fire truck was made by the Howell Company at their factory in Anderson, Indiana. Bill Carter was given the task of retrieving the new fire truck. The volunteers also voted to relax the black ball balloting for new applicants. The single black ball disqualification was eliminated and now it would only take 90% to be approved as a new member. 1967 turned out to be another good year for the department. For the first time the Tri-County Firemen's Association met at the new Sheridan fire house at 1995 W. Hamilton Place. There were 93 firemen from 23 departments present at the meeting. The department agreed to support the V.F.W. with hosting their state convention and bought an ad in their program. First aid classes were given and cards were presented to those that completed the course. Response routes to fires were mapped out. With all of the new equipment it was becoming more difficult to maintain. The volunteers decided to have four meetings a month. Two of the meetings each month would be work nights. In a sad note during November a funeral was held for Ben Ellis. Ben served as a volunteer fireman for over twenty years before retiring in 1963 as Assistant Chief. the firemen had put so much time and money into. The auxiliary served cup cakes, punch and coffee. The City Hall crew paid for part of it [the dedication]. This is the first park in Sheridan and [with] no tax money in it." Years later the park and the maintenance would be turned over to the South Suburban Park and Recreation District. With new fire equipment and techniques the training was becoming more difficult for the volunteers. For the first time in January 1970 the issue of paid firemen was discussed but no action was taken. A new rescue unit was also discussed. The following month specifications were drawn up for a new rescue. At the end of the year the department recommended that Richard Rooney be appointed as Fire Marshal. Rooney was appointed Fire Marshal by the City Council and became the first paid fire fireman in Sheridan. June 7 was scheduled as a training night but there was a very bad fire at Herbertson's pay dump. Herbertson was located on the south side of US 285 at Shoshone Street. The firemen had pumped water from the Platte River for seven hours in order to fight the fire. The Fire Marshal reported in the last month the department answered 14 calls. We now have 59 hydrants in the city and 21 others close enough to use. He also reported there were ten fireworks stands within the city and several over the city limit line. The election for officers was held on June 21, 1971. It was a remarkable event as "John Stanfield and James Proctor announced their intention of retiring and asked that we elected officers to take their place." Art Covey was elected as the new Chief. "It was moved by Rooney and seconded by Carter to give the ex-chief a special badge." Jack Banks was elected as the Assistant Chief. Chief Stanfield had been the chief for twenty-two years. There had been an incredible amount of change and improvements during that period of time. It was just a prelude for the amount of change that was to come during the next twenty years. The Fire Department would be in transition during the next decade. For the next couple of years the changes were not dramatic and the traditions of the department were maintained. Early in 1972 the volunteers purchased a miniature fire truck. It is sometimes referred to as the Crosley because of the engine. The miniature truck was used in several parades and the kids loved it. The department still has possession of the miniature truck but it is need of much work. Back row from left to right: Ron Carter, John Thomas, Bill Carter, Bill Newcombe, Carroll Royer, Lee Brigham, Dan Miller, Don Holman, and Cliff Kealiher. Middle row: Elmer Daubert, Bud Hohn, Glenn Fulton, Fred Mitoff, Ray Forquier, Bill Simonton, Earl John, and Don Yarbrough. Front row: Ted Armstrong, Lymon Butler, Art Covey, Bill Banks, Maurice Nesbitt, Leo Sabin, Ken Dobson, and Jack Lackey. Photo was taken in the early 1970's. Lifestyle changes were beginning to effect personnel in the fire department. The first half of the seventies was marked by many retirements and the deaths of some of the retirees. Fire calls were becoming fewer and ambulance calls more frequent. The issue of ambulance service was again discussed but there was no immediate answer. It was imperative for the volunteers to maintain their first aid skills and first aid cards. In February 1973 it was noted again there were "Very few fire calls last month but several rescue calls. On May 7, 1973 Bear Creek flooded and peaked at the second highest level ever. Many residents on Jefferson Avenue were affected. Most of the firemen worked all day helping people near the creek. The department also responded to a fire call and rescue call that day. Bingo was held one week later and the turnout was poor because the firemen worked on the flood the day they would usually sell tickets. Later in the month Chief Covey was sent to Firemen's school in Grant Junction, Colorado. In June the volunteers won a trophy for the appearance of the miniature fire truck in the Gateway to the Rockies parade. Once again the issue of annexation came up. This time it was about Englewood annexing Sheridan. On September 17 Ronald Carter (the current Fire Chief) was approved to be a volunteer in the department. For years the volunteers had used sirens to summon the firemen to respond to fire calls. It was a problem as the sirens sounded like civil defense sirens and there had been many complaints. On April 29, 1974 there was a training meeting and all volunteers present were given their new RCA (radio pagers) monitors. In July, 1975 volunteer fireman Jack Lackey died in the line of duty. Lackey responded to a three car accident on south bound Santa Fe Drive just over US 285. Jack had finished working with a victim in the first vehicle and moved to the second vehicle. It was at that point that he suffered a massive and fatal heart attack. Jack was rushed to the hospital but was dead on arrival. Jack is the only known Sheridan fireman to die in the line of duty. The first paid fireman was Fire Marshal Rich Rooney. But it could be argued that his duties were not those of a fireman. In 1976 the city hired the first "paid fireman." Lynn Butler was the first person hired to work as a fireman for the department. Lynn had become a volunteer in 1972. He became an EMT just like Newcomb. A year later Butler became a Paramedic. He worked five days a week eight hours each day. The second person hired was Robert Herring. Robert Craig was the third and replaced Herring. Later the duty schedule for paid personnel was expanded to sixteen hours a day, five days a week with personnel divided into two shifts. In 1977 the city annexed the area south of Oxford and east of the South Platte River and the city dramatically increased in size with a whole new set of problems for the Fire Department. During that same year it was required that all paid fire department personnel be qualified as an EMT. It is unclear who the first paid fire chief was for the city. Art Covey was an employee of the city from 1972 to 1981 and worked in several capacities. Twice during that time he was elected as the Fire Chief by the volunteers. The City Council hired Frederick P. "Pete" Cachet as Fire Chief in June, 1979. 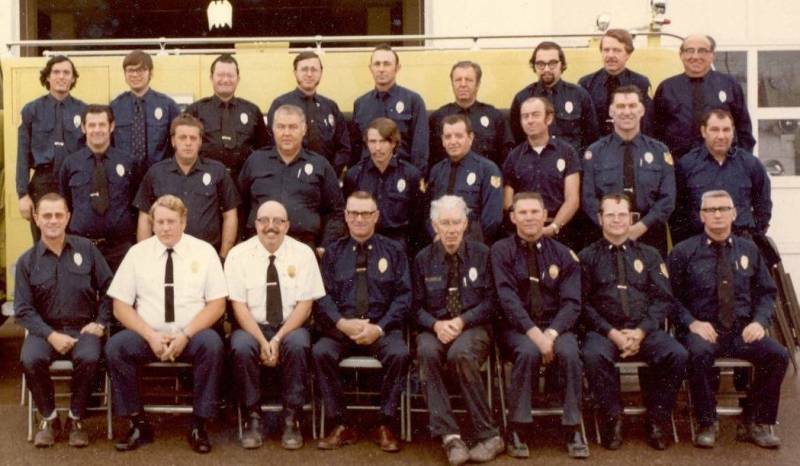 In 1980 the City Council adopted an ordinance which clearly defined the structure within the fire department as it transitioned from an all volunteer to a combined department with paid and volunteer personnel. Cary Weaver and Darryl Harcrow were hired in 1980. Both are now Captains and still with the department. In 1984 additional personnel were hired so there were three people on each shift. A year later a twenty-four hour two platoon shift was implemented with three people per shift. A minimum manning of two people on duty was established. In 1983 additional people were hired and a twenty-four three platoon shift schedule was implemented and the minimum manning increased to three people. Staffing was still a problem as the volunteer ranks thinned and it was difficult for volunteers to respond to calls during the day while they were working their regular jobs. The change in personnel was very dramatic between 1975 and 1978. On Friday, May 27, 1983 at about 10:30 pm some motorists passing by reported a fire at University Park Lumber Company located at 1810 West Oxford Avenue. The fire lit up the night sky and could be seen as far south as Sedalia and jammed traffic on South Santa Fe Drive. The crowd watching the blaze was so large the Denver Police Department was called in to assist with traffic. Arson was suspected in the three alarm blaze. Nearly forty (40) fire fighters from both the Sheridan and Englewood Fire Departments responded to the fire. It took over two hours to contain the fire. Two buildings in the lumber yard were destroyed and the main office of the lumber company was severely damaged. Total damage was estimated at over $500,000. Fire fighters stayed on the site well into Saturday putting out hot spots. There were no injuries from the fire. Arson was suspected as evidence of a flammable liquid was found throughout one building. Beginning in 1984 the paid fire fighters were required to complete the course at the South Metro Fire Academy. Original departments participating in the fire academy were Bancroft (now West Metro), Castlewood (now South Metro), Englewood, and Littleton. It is now called the Metro Fire Academy. When the academy was first formed Sheridan could not afford to participate in the consortium. Later on Sheridan participated by paying an annual user fee at a discounted rate. It took several years for all of the paid fire fighters to complete the academy. The difficulty was staffing. Any fire fighter that was at the academy was not available to work. Now there are three academies available for fire fighters in the Denver metropolitan area. The department now tries to hire fire fighters that have already completed the training. Over the years some members of the department have taught at the Metro Fire Academy. Sheridan now provides a forty hour mini academy for the volunteers in the department. Formalized "Mutual Aid" agreements were made with the cities of Englewood and Littleton. Manpower was still an issue during the eighties as the volunteer ranks continued to thin. A method was devised to recruit the volunteers from the Englewood Fire Department. Englewood was going to an all paid department. In 1985 additional personnel were hired. A new ambulance was purchased. Full time advanced life support (Paramedics) was implemented. That same year an "Automatic Aid" agreement with Englewood was adopted. Staffing improved as personnel on each shift included one lieutenant, two paramedic/firefighters, and one regular firefighter. It would be a staffing level that would be very difficult to maintain in the years ahead. On September 6, 1985 the Alpine Lumber yard at Oxford Avenue and Santa Fe Drive caught on fire. This was a result of a collision between a semi tractor trailer and a south bound Burlington Northern coal train with 114 cars. The train jack knifed the truck and trailer rig and pushed it down the track about a quarter of a mile. The fuel tanks on the truck were split open causing the fuel to spill. The sparks coming from the breaking train ignited the fuel as the train moved down the track catching the adjacent lumber yard on fire. Fire Marshal Robert Pistor was in a fire engine sitting at the intersection returning from an inspection when the collision occurred. It was about 3:22 pm and he immediately called for help and laid a hose from the hydrant on the west side of Santa Fe effectively closing the street to traffic. Englewood responded to the east side of the fire. A second alarm was called three minutes later and after another six minutes a third alarm was called. By that time the smoke from the fire could be seen across metropolitan Denver. The Littleton Fire Department responded and started fighting the fire from the south end. Englewood paramedics pulled the truck driver and a passenger from the burning wreckage. Both of them were severely injured. They were taken to Swedish Medical Center and later transferred to the burn unit of the Brooks Army Hospital in Texas. The truck driver later died. The six crew members from the train escaped injury. The Sheridan fire fighters were on the west side of the tracks and unable to attack the fire on the other side of the train. Aerial apparatus from Englewood and Littleton were used to attack the fire. Some of the rail cars of coal caught on fire. The engines at the front of the train were cooled with water from the fire trucks. The train crew was requested to split the train. The engines at the rear of the train were used to pull the train cars back away from the fire. That opened the access on Oxford Avenue to the lumber yard. Units from the Bancroft Fire Department responded to put out the fire in the coal cars. All members of the Sheridan Fire Department were called to duty. Eventually 17 fire units with 60 fire fighters responded from Sheridan, Englewood, Littleton, Bancroft, Glendale, and Arvada to the fire. It was about two hours before the fire was brought under control. Sheridan fire fighters remained on the scene for two days putting out spot fires. Damage was estimated over $250,000. With all of the changes in the fire department some of the long standing traditions were fading away. The volunteers put on their first bingo in 1950. It was a tradition that had lasted thirty-five years. The last fire department bingo was held about 1985. Many of the retired firemen and their wives attended the event. The middle school gymnasium was packed. Some of the retired firemen helped selling bingo cards during the games. The game numbers were called by volunteer fireman Carroll Royer. In the 1987 the city built a new municipal center located on the corner of Federal Boulevard and Oxford Avenue. The building included the general government, a court and council chambers room, the police department, and a new fire station. Equipment was split between the two stations with the front line fire trucks and ambulance placed in the new station. The city held a "Sheridan Celebrates" in 1987 with the opening of the new municipal center. That brought the life back into the Fire Department's annual pancake breakfast. The breakfast became regular part of the annual "Sheridan Celebrates" activities beginning with the city centennial celebration in 1990. Chief Steinberg was suspended with pay on the following Friday by the City Administrator Jimmy Curnes. Fire Lieutenant Ronald Carter was named as the acting Fire Chief. About a week and half later Steinberg was charged with first degree arson and criminal mischief over $10,000.00. Both are felonies. The City Council placed Chief Steinberg on unpaid leave pending resolution of the court case. The Colorado Bureau of Investigation, Arapahoe County Sheriff's Office, and Englewood Police assisted the Sheridan Police Department with the investigation. The Sheridan Police Department investigator assigned to the case was Michael Anthony. Investigators had to wait for laboratory results before they were able to determine how the fire was set. The case went to trial just over one year later in 1988. Retired Denver District Judge Robert Kingsley was requested to preside over the trial. The trial lasted about three weeks. Several witnesses were called to testify. It addition many experts were called to testify. As is typical with arson, the case was based on circumstantial evidence. The jury was out for three days before returning a verdict of guilty. Kingsley sentenced Steinberg to ten years probation and ordered Steinberg to pay restitution of just under $40,000.00. During 1990 the city bought its first brand new truck since the 1970's. It is a Gruman Fire Cat. It has a 1,000 gallon water tank and is capable of pumping 1,250 gallons per minute. The old ford trucks could only pump 750 gallons per minutes. It did not seem significant when Kmart announced the sale of Pace Warehouse to Wal-Mart in December, 1992. Sheridan had experienced a ten percent revenue drop in sales taxes in 1993. The sale to Wal-Mart was completed in November, 1993. It was announced that Wal-Mart would sell the Pace Warehouse on West Oxford Avenue and the speculation began on the closure of the Oxford location. With no buyer, Wal-Mart scheduled the closure of the Pace Warehouse in Sheridan to be completed by January 1, 1994. The loss of Pace Warehouse threw the city into a budget crisis. One third of the city budget, about one million dollars was slashed overnight and about seventeen positions were cut. Seven paid positions were cut from the Fire Department. The City Administrator recommended that his own position be cut. Fire Chief Mark Wallace would assume the responsibilities once held by the City Administrator. Wallace would eventually assume the position of Public Safety Director. The Police Chief position was also cut and those responsibilities were also given to Wallace. It would be a over a year and half before Wallace would get relief when the Police Chief position would be reinstated and filled by Michael Maudlin. But it was too late as a burned out Wallace would resign three months later. Ron Carter became the Fire Chief in December, 1995 after the departure of Wallace. It would not be until April, 1996 before Sheridan would again have a City Administrator when Randy Young was hired for that position. The highest single expense item for the city was the payment of the bonds for the municipal center. The first discussion about moving out of the Municipal Center occurred in 1994. There was an attempt to refinance the municipal center but the effort was not successful. On September 19, 1997 the city moved out of the Municipal Center. All of the city departments including the police were moved into a leased facility at 3231 South Zuni Street. The Fire Department moved everything they had back into station number one at 1995 W. Hamilton Place. It would be December, 1998 before the city reacquired and moved back into the Municipal Center on South Federal. Once again the Fire Department equipment was split between the two fire stations. Staffing was not added back to the fire department until 1998. At that time the paid staff increased from eight personnel to nine with the Fire Chief still doing shift work. Another position was filled in 1999. But it would be 2001 before the Fire Chief was removed from shift assignments and returned to 100% supervision and management duties. About 1990 the department established new participation requirements for volunteer personnel. The need to respond to individual fire calls was eliminated. Instead the volunteers would spend shift time at the fire station. Each month they were required to spend twenty-four hours at the station. At the current time each volunteer is required to spend forty-eight hours a month at the station. Today's volunteers are required to be state fire fighter certified with an approved academy. In addition they are also required to be certified as an Emergency Medical Technician. In 1998 the department obtained a new ambulance. The City applied for a state grant which paid fifty percent of the cost of the vehicle. It is Chevrolet McCoy/Miller ambulance with four wheel drive. The previous ambulance had been in service for seven years. On Tuesday, February 22, 2000 about 9:30 pm there was a significant fire at Western Metals Recycling located at 2100 W. Oxford Avenue. This is a salvage yard facility that recycles vehicles. Several vehicles caught on fire. The Sheridan Fire Department requested assistance and the Littleton, Denver, West Metro, and South Metro fire departments responded. The hazardous materials team from the Arapahoe County Sheriff's Department also responded. The flames shot up thirty feet high. The smoke drifted east to the Cherry Creek reservoir about ten miles away. The vehicles had to be pulled apart to fight the fire. It was reported that Englewood Schools closed their ventilation systems because of the smoke. The Englewood Golf Course was also closed for one day. The facility is adjacent to the South Platte River. There was a concern about the water run off polluting the river. Catch booms were placed across the river. Water samples were taken at the scene and down river at Confluence Park in Denver. The EPA said there no detectable levels of gasoline, diesel, or solvents. The fire was finally extinguished about 4:00 pm the next day. There were no injuries reported. A brand new fire truck was purchased in June, 2000. It was manufactured by American LaFrance with a water capacity of 1,000 gallons. The engine has a 1,500 gallon per minute pump and is fully equipped with basic hazmat, extrication, and fire fighting equipment. 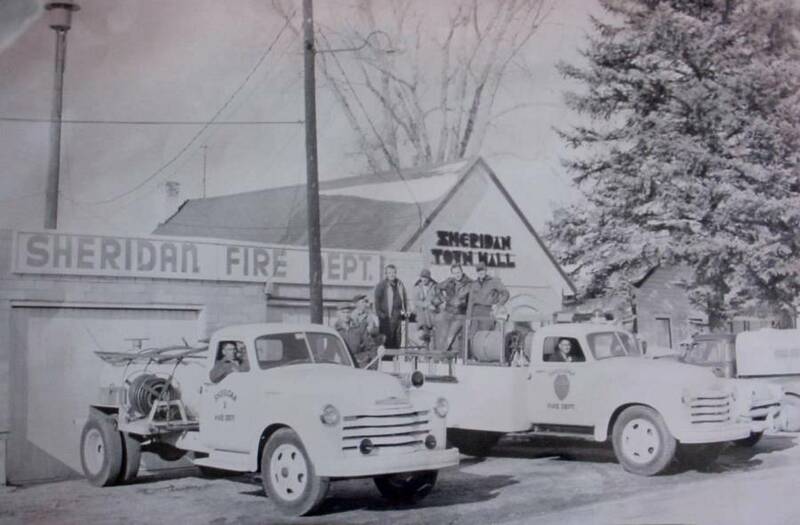 The Sheridan Fire Department has a history that spans over seventy-five years. It is a department with humble beginnings. The department started with a couple of simple hand pulled chemical carts and improvised improvements throughout the years. Today the department has the most up to date and sophisticated equipment available. The personnel in the department have transitioned from a totally volunteer staff to a combined paid and volunteer staff. In the beginning there was no training available for the volunteers. Academies are now available which provide training in the class room, practical exercises, and emergency medicine. The increased need for training over the years is reflected in the calls for service volume. Remember the fire department had only 39 calls for service for the entire year in 1955. In 2002 the department answered 1,166 calls for service for an average of 22 calls per week. 648 of those calls were for emergency medical service.